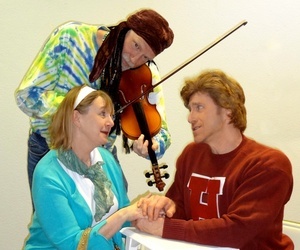 Posted on Mon, Mar 5, 2012 : 5:18 a.m.
Wendy Fritz, Gary Glover and Leo Babcock in Saline Area Players' "The Carol Burnett Shows: Your Favorite Sketches." Variety shows have gone by the wayside, but one of the all-time best was “The Carol Burnett Show” (1967-78). And thanks to the Saline Area Players, locals will get a chance to watch 11 classic sketches from the show come to life on stage. Included in SAP’s show, “The Carol Burnett Show: Your Favorite Sketches” will be: “Went With the Wind,” with Starlett O’Hara and Rat Butler; the soap opera parody “As the Stomach Turns”; Mr. Tudball and his secretary Mrs. Wiggins; and ornery, elderly Mama Harper, along with daughter Eunice and son-in-law Ed. What: 11 classic sketches from “The Carol Burnett Show” - including “Went with the Wind” and the soap opera parody “As the Stomach Turns” - come to life on stage. Where: Stone Arch Arts and Events, 117 S. Ann Arbor St. in Saline. When: Thursday and Friday, March 8 and 9, at 8 p.m.; Saturday and Sunday, March 10 and 11, at 2 p.m., and a special dinner theater performance on Saturday, March 10 at 7 p.m. Doors open 30 minutes before each performance. How much: $15. Dinner theater performance tickets cost $40 per person. For more specific information, including the dinner theater menu, visit www.salineareaplayers.org. (For a behind-the-scenes look at the process of mounting the show, visit Mary Rumman’s blog, www.onandoffthestage.blogspot.com.) Advance tickets may be purchased at Maureen's Designs, at 101 S. Ann Arbor St. in Saline; via e-mail at tickets@salineareaplayers.org; online at the SAP site; or by phone at 734-904-1874. This is Hindes' third show with SAP, and each one has been a comedy.